What do you do when the neighbors invite you over for a BBQ and you’ve got about 30 minutes to throw together a quick side dish? 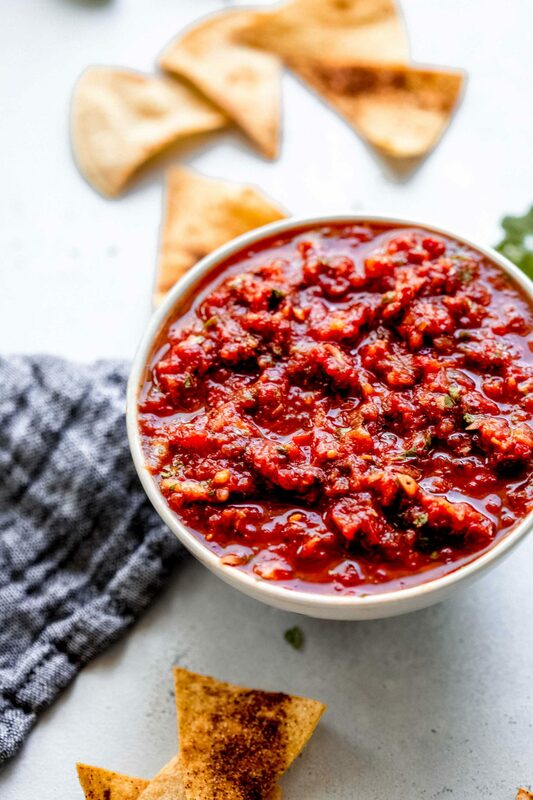 Run to the store, grab a few simple ingredients, throw them into the blender, and in 5 minutes flat you’ve got the most amazing chipotle salsa. 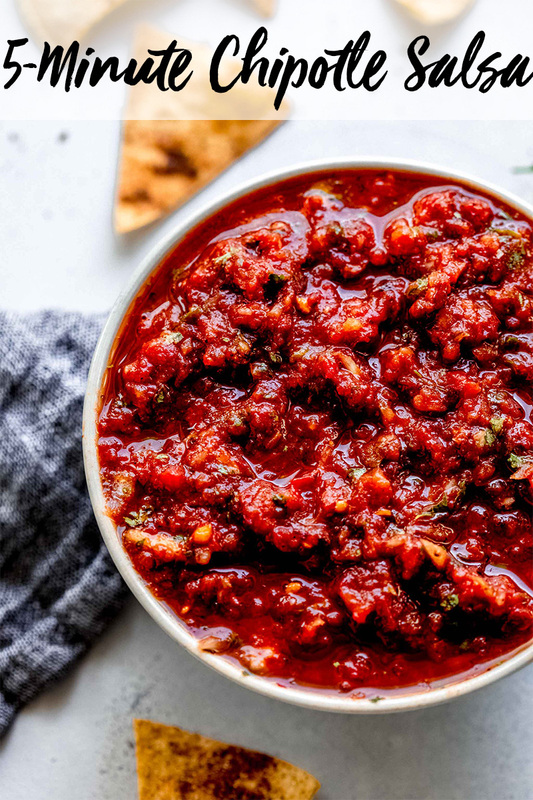 This isn’t your basic salsa recipe. With fire roasted tomatoes and chipotle peppers, it’s got a smoky kick. Which makes it a perfect compliment to any grilled dish. Sometimes I like to top this salsa off with some cubed up avocado. It’s a bit like a guacamole-salsa hybrid. Only brighter and fresher. You could also add some corn to this salsa and it would be amazing! I would take some frozen corn, give it a quick saute in a hot skillet until it’s just charred, and then stir it in. Yum! 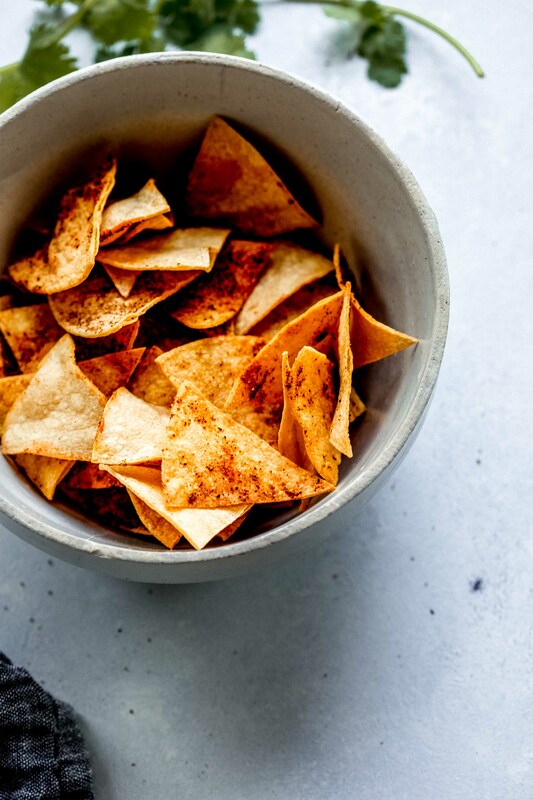 If you’re feeling extra ambitious, may I suggest trying your hand at making these Baked Tortilla Chips? Honestly, it’s almost as easy as making the chipotle salsa. All you need to do is cut some store-bought tortillas into wedges, spray them with oil, and sprinkle them with a little seasoning. Pop them into the oven while you’re making the homemade chipotle salsa and you’ll impress everyone even more. Just add all the ingredients to your blender and process until it reaches your desired texture. This blender salsa will be ready to eat in less than 5 minutes. 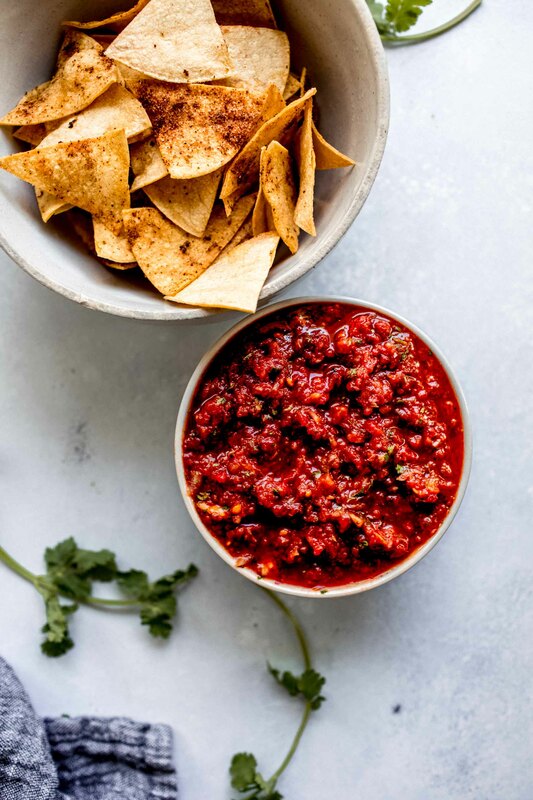 The salsa can be made ahead of time and stored in the fridge for up to a week. Just be sure that you don’t add the avocado until just before serving. Pop any leftover chipotles (and their sauce) into a ziploc bag and store it in the freezer. Next time you need one, just thaw it under warm running water for a minute, and you’re good to go! 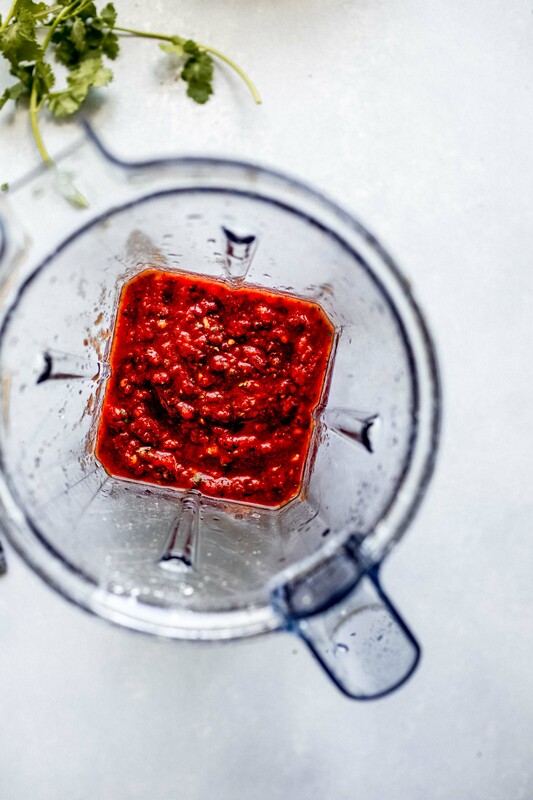 This 5-Minute Chipotle Salsa comes together easily with the help of your blender. Cube up some creamy avocado and add it to this spicy, smoky dip for a creamy treat! Add all ingredients (except avocado) to a blender or food processor and process until it reaches your desired consistency. Pour into a bowl. Peel and chop the avocado and add to the bowl. Serve immediately. This recipe was originally published in August 2015. It was updated in April 2019 to add new photographs and update content. The original salsa recipe remains the same. Enjoy! If you loved this Chipotle Salsa recipe I would appreciate it so much if you would give it a star review! Also, be sure to snap a picture of your finished dish and share it with me on Instagram using the hashtag #platingsandpairings. Homemade salsa is just the best! Looks amazing with your homemade tortilla chips too. Great start to any party! 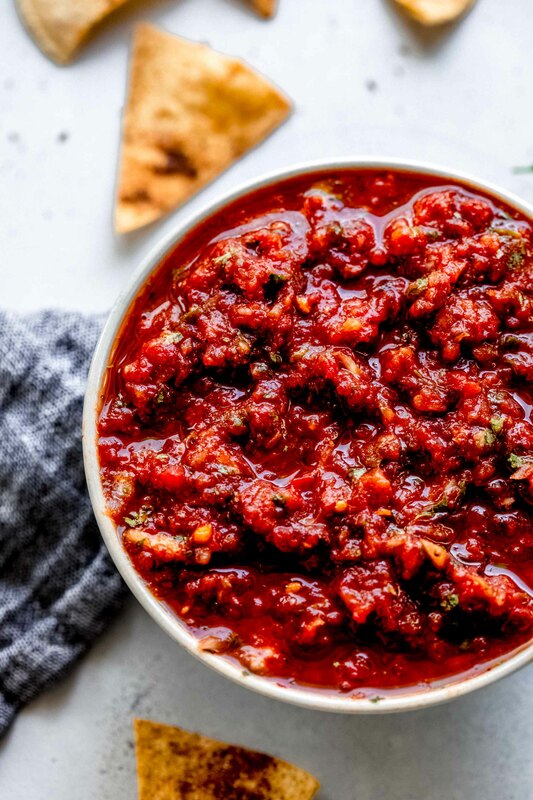 This is a gorgeous salsa! I love chipotle in ANYTHING. My mom does a chipotle salsa that contains an entire can of chipotle in adobo. It’s INTENSE! This one is much more my alley. Whoa! I don’t know if I could handle an entire can, but I’d give it a try! I love sticking a few chipotles in adobo in salsa and also sauces! They add so much flavor and just the right amount of heat! Great 5-minute save when you need a last-minute delicious dish to bring over! They add so much flavor, don’t they?